Perennial with mounded, clump-forming habit. Full sun. This beautiful perennial has many wonderful qualities. Tall, purplish/pink flowers appear on stalks in summer above the dark green, mounded foliage. 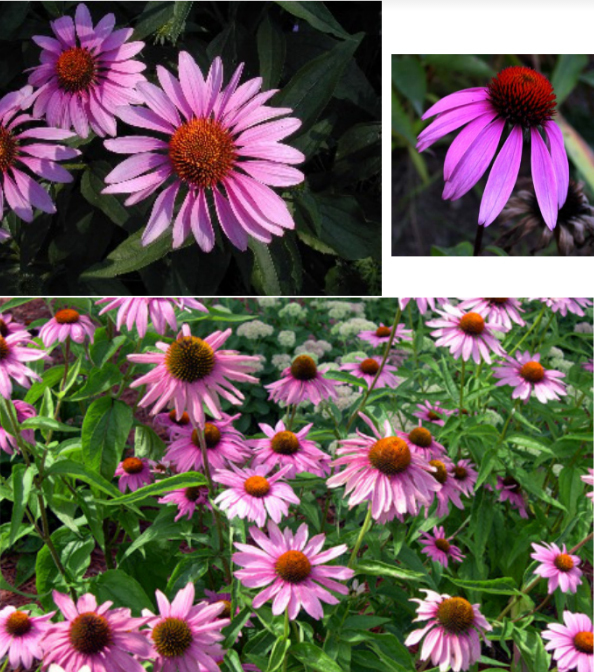 Used often for its medicinal properties providing strength for the immunity and health in teas and medicines, when in a landscape Echinacea is great in perennial gardens, cut flower and woodland gardens, borders, pollinator gardens and firescaping. It attracts bees and butterflies prolifically. Dying back in the winter, the old cones and foliage can be removed after turning brown and the seeds scattered. Follow a regular watering schedule during the first growing season to establish a deep, extensive root system. Requires less water once established. For a neat appearance, remove old foliage before new leaves emerge. Divide clumps every 2 to 3 years in early spring.